Silas was counting the seconds until he could crawl into bed and pass out. However, he wouldn't leave it up to his reluctant hostess to wipe up the bloody mess he'd made of her kitchen. "We need to clean up the floor before we go." The woman was nothing if not stubborn. "I can take care of it. You need to lie down before you fall down." "I do, but you've put in a full day, too. Rather than waste more time arguing, tell me where the mop is." In the end, she insisted on helping, but at least they got the job done. Lydia put away the cleaning supplies and then repeated what she'd said earlier. "If you can still walk, I'll show you the apartment." Moving slowly, Silas grabbed his pack and followed Lydia into a small office that opened off the back of the kitchen. He would have offered to carry the basket of groceries she'd put together for him, but right now it was all he could to put one foot in front of the other. He paused just inside the doorway to look around. At first glance, there was no obvious exit out of the small room except the door he'd just come through. Lydia, who had still been looking pretty shaken by his collapse, smiled just a little as she slid her hand under the top of the desk. She must have pressed a button or flipped a switch of some kind because there was a soft click and the tall bookcase in the corner shifted slightly. "This building was a speakeasy back in the day, and I guess the owner wanted to make sure he had a bolt hole if the cops came calling. There is another way to access the apartment, but that would entail both of us hiking around the block to come in from the other side. I don't know about you, but I don't have the energy for that tonight." Maybe she really was tired, but he suspected she was more worried about him than she was herself. Knowing she saw him as being weak stung, but he didn't blame her. After all, he'd just done a face plant on her kitchen floor. 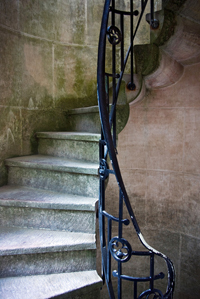 She gave the bookcase a hard tug, swinging it away from the wall to reveal a hidden staircase. "There's a release just inside, so you can come and go anytime you want. Having said that, Joseph always made a point of coming through the front door. He preferred to keep this route to his personal quarters a secret from most of the staff. The only two who know about it are myself and my head chef, Caleb. He's the only other holdover from when Joseph was still running the restaurant." Without waiting for him to respond, she disappeared through the opening, leaving him no choice but to follow her down the narrow staircase. At the bottom, she stopped in front of a door that seemed to face the wrong direction. If the apartment was under the restaurant, the entrance should have face the other way. Meanwhile, Lydia unlocked the heavy metal door and then handed him the key she'd used. "I have a duplicate, but I won't enter uninvited." "Fair enough, but I thought the apartment was under the restaurant." She shot him a grin over her shoulder as she opened the door farther and flipped on the lights inside. "Actually, it's under the back parking lot. The basement directly under the building is all storage for the restaurant. The two areas are divided by a solid concrete wall, so no one can gain access to the apartment from the other side." "It is. I love the whole idea of some prohibition mobster having his own escape route. Or maybe his customers used it as a hideout when the cops were after them." If it kept the Feds out, chances were he'd be safe from the pack currently hunting him. Well, unless they traced his scent as far as the office. "On that note, it might not be a bad idea to accidently spill some bleach or even some wine in the kitchen and your office. Either one will cover up the smell of blood." Lydia froze in place. "Do you think whoever is hunting you will follow you here?" He owed her his honesty. "I did my best to throw them off the trail, but I can't promise that they won't managed to find me. I thought I'd lost them before I got to this area. I didn't use credit cards or a cell phone that would have let them trace me electronically. Right after I reached town, I checked into a cheap motel and paid cash. However, the pack tracked me somehow. When I came back from dinner, something happened at the motel that had the place swarming with cops, and the door to my room was standing open." And he hadn't slept since. It was getting harder and harder to stay upright. She finally moved farther into the apartment. "And what would have happened if you'd been in the room when those guys got there?" He leaned against the doorframe. "Let's just say, you wouldn't have a new temporary tenant to bother with." "Are these guys a danger to me or my customers and employees?" The slight quiver in her words added to his guilt over dragging her into his mess. "My people haven't stayed hidden from humanity this long by being reckless. Having said that, they're also not above physical violence when they think the situation warrants it. They want me dead, and they're getting more brazen in their efforts to find me. Normally, they would never have done anything that would drag the police into pack politics." She stood back and motioned him to come farther into the main living area of the apartment. As he walked past her, she asked, "And the bottom line?" He did a slow turn to check out his new temporary home. When he was once again facing her, he finally answered. "If they come looking for me, tell them where I am and get your people out of the line of fire. I don't want anyone else to die because of me." Lydia drew a sharp breath at his stark assessment of the situation. What the hell had he done that had killers hot on his trail? It wasn't any of her business, but as he had just pointed out, she had her employees and customers to think about. He must have sensed her dismay, because he dropped his pack on the floor and stepped close enough that she could feel the heat of his big body. "I promise I will do everything in my power to protect you from my problems. All I need is some downtime to let my injuries heal up and a few hot meals under my belt. A day, maybe two at the most. But like I said earlier, say the word, and I'm out of here." Once again, she studied the intriguing man in front of her and then offered him a rueful smile. "Even if I was tempted to do that, which I'm not, I have serious doubts you could make it back up the stairs. Let's get the bed made up, so you can lie down before you fall down again." His pale eyes turned frosty. "I'm not helpless, Lydia. Even half dead and bleeding, I'm more than capable of taking care of myself." "I believe you. That doesn't mean you should have to." Rather than continue the discussion, she walked away, stopping long enough to grab a fresh set of towels from the linen closest. 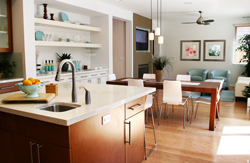 "As you can see, this is the living room/dining room area. The kitchen is fully equipped. The guest bedroom is through that door, not that I figure you're going to be hosting any sleepovers while you're here. The master suite is down this hallway." He followed right on her heels, but she wasn't surprised when he came to an abrupt halt right after walking into the giant bedroom. She hadn't been lying when she'd said the apartment was sparsely furnished, but the one exception was this room. She had never been able to figure exactly how Joseph had gotten the giant platform bed into the place. The dresser, too, for that matter. Silas looked a bit stunned. "Wow, I never expected anything like this." She laughed. "I did replace the mattress, but the new one is top of the line just like the old one was. I've always hoped that Joseph would come back to visit sometime, and he does like his comfort. I also upgraded the television, and the cable service is still hooked up. Pointing at a door in the corner, she added, "The bathroom is just as fancy. There are towels, extra toothbrushes, and other stuff in there. Feel free to use whatever you need." She started to walk away but then turned back. "Oops, I almost forgot. You need to know how to get out of here the other way. There's another metal door at the end of the hallway. That same key works on that lock, too. On the other side is a passageway that comes out in an old single-car garage on the far end of the parking lot. It faces the other street, so no one associates it with the restaurant. You should be safe coming and going that way." Before leaving, she risked his temper one last time. "Are you going to be all right getting yourself situated down here? I can hang around for a while longer if you need me to." His jaw tightened. "I'll be fine." At least this time there was no hint of anger in his voice when he answered. Maybe he knew she meant well or maybe he didn't have the energy to waste. "Okay, then I'll be going. On the way out, I'll stash the groceries in the fridge." He followed her as far as the hallway. "Thank you for everything." "You're welcome. If you need anything before the restaurant opens in the morning, just pound on the back door, and someone will let you in. I'll lock up on the way out." "One more thing. 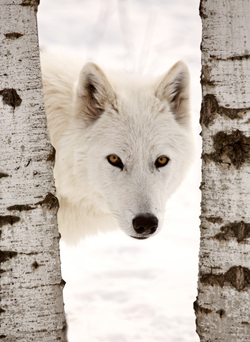 My twin soul is an arctic wolf with white fur. Unlike most of my kin, my eyes stay blue when I shift. The ones hunting me are mostly arctic, too, but their eyes are brown." Although it was hard to get her head around the fact that the man behind her could shift forms like that. It was if she had been dropped into the middle of a fantasy movie. As she walked away, she could feel the heavy weight of his gaze on her back. Just as she was about to walk out, he called after her, "Don't forget the bleach, Lydia. It plays merry hell with the sense of smell for the twin-souled." With that happy thought, she trudged back up to the kitchen and got the mop back out.